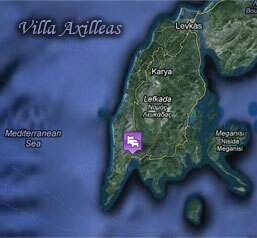 Villa Axilleas is an A’ class resort with 3 double bed studios, 3 triple bed studios and 2 four bed apartments. Apartments are convenient for families with 1 or 2 children, comprise of living room with kitchen corner and sofa (convertible to a double bed), bedroom with double bed, bathroom and 2 balconies. All studios and apartments are furnished with bathroom with shower, Air conditioning, TV, wireless wideband internet access Wi-Fi and a modern fully equipped kitchen corner. Both studios and apartments have furnished balconies with a bird’s eye view of the beach, the mountains and the sea.